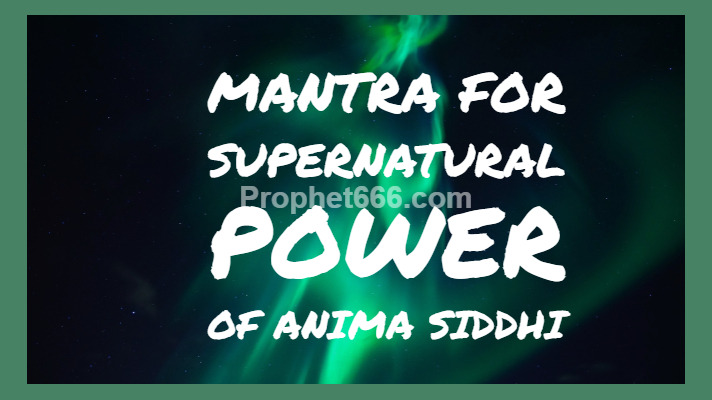 In this post, I have written about a specific Mantra that is said to grant Anima Siddhi or the supernatural power to become tiny or almost invisible to the naked eye. Anima Siddhi is one of the eight or Ashta Siddhis that enables the practitioner to become so small that he is able to penetrate anything, including an atom. The power and use of Anima Siddhi has been well documented in various religious scriptures, especially in those relating to Hanuman who had Siddhi over all the Ashta Siddhis, including Anima Siddhi. Hanuman made the use of these Siddhis, especially Anima Siddhi and Mahima Siddhi, which is the supernatural power of increasing the size of the body and making it gigantic, the Mahima Siddhi was used by Hanuman to lift and carry the Dronagiri Parvat to save Lakshman during the Great War or Lanka. He had earlier made use of the Anima Siddhi to move around unnoticed in Lanka and find the exact location of the place where Sita was held captive by Ravan. The Mantra described in this post is dedicated towards the Vikala Yakshini and is a variation of the Mantra that is normally available in most texts and also on the Internet for invoking the Vikala Yakshini. This Mantra to gain Anima Siddhi has been given below and as per authentic scriptures on Yakshini Tantra, the Mantra has to be chanted for three months in the house, which is the house of the practitioner. The Tantra has not prescribed a fixed or specific number of Mantra Chants for this Vikala Yakshini Mantra Prayog. This means that the practitioner has to keep chanting the Mantra as many times as possible, while he is inside his home. The Tantra has also not prescribed any kind of Puja-Vidhi or accompanying ritual for this Vikala Yakshini Mantra Prayog. The Tantra also mentions that after three months of the chanting of this Mantra, the Vikala Yakshini will be appeased and she will grant the practitioner the supernatural power of Anima Siddhi or the ability of becoming tinier and the tiniest. The description of the Vikala Yakshini does not appear in the Tantra and if any reader or Yakshini Sadhak has information about her and this Prayog to become tinier and the tiniest particle, then he should kindly share his information with other readers of this site. Note- It would be most appropriate to add that such supernatural powers can only be gained by only a handful few and apart from the chanting of the Vikala Yakshini Mantra given in this post, there are likely to be many other factors involved for this and similar Mantra Prayogas. आप रुद्रयामल ,मंत्र महोदधि ,मंत्र महार्णव ,दत्तात्रेय तंत्र ,साबर मन्त्र संग्रह में काफी जानकारी प्राप्त कर सकते हैं .ये पुस्तकें नेट पर मुफ्त उपलब्ध हैं .यदि दिक्कत हो तो तो मुझे .satyanidhi1939 @ gmail पर संपर्क करें .मैं आपको ईमेल से भेज दूंगा .